Polarlys is Norwegian for ‘polar light’, the special Arctic phenomenon that many guests seek when travelling aboard this ship. MS Polarlys was refurbished in 2016 and now features a modern, Arctic-inspired interior. On board are three different restaurants, the Multe bakery and ice cream bar, a sauna and fitness room. Out on deck you can enjoy the view from one of the two Jacuzzis. There is a comfortable bar at the front of the ship where you can enjoy a nice traditional drink. The vessel also has a large compass area were you find the reception, a tour guide, conference room and shop. 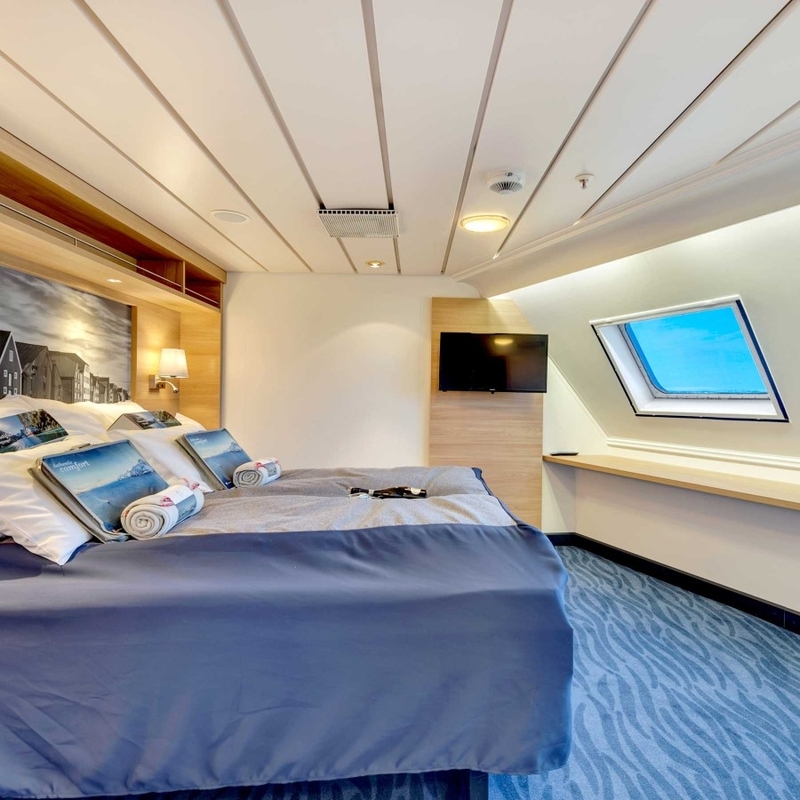 The MS Polarlys offers guests a choice of warm and cosy cabins, with options ranging from Inside, Outside, Mini Suite and Suite. For unforgettable scenery, choose a cabin with a sea view to make the most of sailing through some of the world’s most spectacular fjords and waters. Savour bountiful breakfast buffets and three-course evening meals in the dining room, with its panoramic windows to ensure you don’t miss the magnificent views even when dining. Experience delicious authentic Norwegian cuisine and eat like a true local with Hurtigruten’s unique dining concept, Norway's Coastal Kitchen. Guaranteeing seasonal, fresh food from the local area, the talented chefs enjoy telling the story of the local area through their delicious dishes. While chasing the polar light, guests can keep active on board MS Polarlys with the fitness equipment and whirlpool. The ever-changing landscape is the special allure on board MS Polarlys, which explains why the observation lounge is one of the most popular public areas on the ship. With its panoramic views and comfortable 360-degree swivel chairs, it is the perfect spot to wonder at the sky and the beautiful changes in light. The expedition and information team are always on hand, bringing you the most memorable and exciting excursions at each major port. These comfortable, standard inside cabins for two people on the lower deck have bathrooms with shower/WC, and separate beds, one of which converts into a sofa. These elegant suites on the upper deck have one or two rooms and a seating area. The suites also have a TV and internet access (at an additional cost), and a great view. These comfortable suites for two people on the upper deck have double beds, and most have sofa groups as well. The suites also have a TV, internet access (at an additional cost), and great view.